On Saturday, June 30th 2012, contemporary ballet choreographer and innovator William Forsythe will receive the prestigious Samuel H. Scripps/American Dance Festival Award for Life Achievement in Modern Dance. The award will be presented by one of his former company dancers, Jill Johnson before Hubbard Street Dance Chicago’s performance at the Durham Performance Arts Center in Durham, North Carolina, which will include Quintett, a piece created by Forsythe in 1993. Past recipients of this award have included Martha Graham, Merce Cunningham, Paul Taylor, Alwin Nikolais, Katherine Dunham, Alvin Ailey, Anna Sokolow, Twyla Tharp –and the list goes on. Choreographer and designer William Forsythe’s 35 year career is noted for the huge advances he has made in classical ballet, deconstructing the form to create an expanded corporal vocabulary that is still recognizable as ballet. His consistent emphasis on collaboration, improvisation, and deviation from the strict confines of regimented classical protocol has brought him comparisons with George Balanchine who did the same with 19th century ballet technique, breaking structure to turn it almost literally on its head. Though he was born in Manhasset, Long Island, most of Forsythe’s career has taken place in Germany. After studying in the States with the Joffrey Ballet and School of American Ballet, he was invited by John Cranko to join the Stuttgart Ballet. He created his first ballet for the company in 1976 as a part of their young choreographer’s showcase and soon after was named Resident Choreographer. He went on to direct Ballet Frankfort from 1984 to 2004 and is currently the director of The Forsythe Company, which he founded in 2005 and maintains through subsidies from the cities of Dresden and Frankfurt am Main as well as private sponsors. Forsythe’s work has been performed by many companies, including Russia’s Kirov and Bolshoi Ballet companies, NYC Ballet, San Francisco Ballet, the National Ballet of Canada, the Royal Ballet, Paris Opera Ballet, The Joffrey, and many more. His collaborations with many artists including the composer Thom Willens who has created much of the music for his ballets, costumer designers such as Issey Miyake, and often his own set and lighting designs lend an added depth and dimension to his already sophisticated choreographic vision. In addition to his choreographic gift, Forsythe has also created numerous installations, some of which have been shown at the Louvre, the Venice Biennale, Creative Time in NY, and Artangel in London. His short film, Solo, was shown at the 1997 Whitney Biennale. Original, challenging, beautiful, and always recognizable for its particular choreographic stamp, Forsythe’s work can be intriguing, mysterious, spectral, and scandalous. 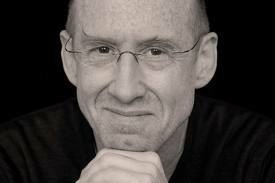 As one of the great choreographers of our time, Forsythe is often imitated, but never duplicated and rarely surpassed. That he is being honored by the Scripps/ADF Life Achievement Award is a just acknowledgement for an enormous contribution towards the evolution of the art form.